Williams Level 7 MPU boards were used in games from 1980 (Black Knight) through 1984 (early Star Light). 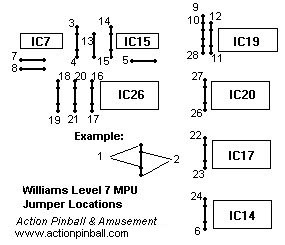 All L7 boards used the same jumper settings for the ROM chips, and same size ROM chips EXCEPT Hyperball, and Defender pinball. If you are swapping a board from Hyperball or Defender into any of the other Level 7 games, (or vice-versa), you will need to change ROM chip jumpers accordingly (and the ROMs, too, of course). The map and chart below give locations and settings of the individual jumpers for the particular game you are running. If you need ROM chips for your game, be sure to check our ROM Chips Page. We have all Level 7 ROM chips in stock. The following chart indicates the setting for each individual jumper on the board, according to the game it's in. Settings below have been used and tested and will work. A setting of TRUE indicates jumper is set (present). As setting of FALSE indicates jumper is not set (removed). Jumper settings left blank ("-") are unknown, or irrelevant. If you have any info to add to this chart, or any corrections, please e-mail us. Firepower II, BK, Pharaoh, etc. 25 Associated with IC36 sound PIA.